Peshmerga fighters have repelled a major attack by Islamic State south-west of Irbil, the capital of Iraq's Kurdistan region, officials say. A source told the BBC that more than 200 militants launched assaults on Peshmerga positions in three villages near Makhmur and Gwer late on Tuesday. The fighting lasted until dawn on Wednesday, the source said, adding that "dozens" of militants were killed. The Peshmerga received support from US-led coalition aircraft. The coalition has conducted more than 1,200 air strikes in Iraq since August, when IS militants overran the Peshmergas' defences in the north. The Kurds have now regained most of the ground they lost in the summer and begun to surround Mosul, as Iraqi government forces prepare to launch an assault to recapture the city. 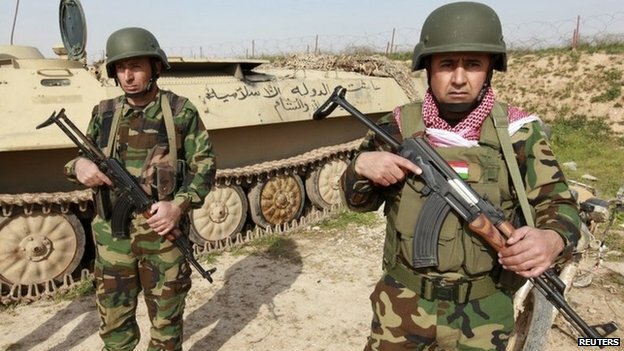 However, Peshmerga commanders say they remain poorly armed compared with the jihadists. The Peshmerga source said the force's positions in the villages of Sultan Abdullah, Tal al-Reem, and Jarullah - about 40km (25 miles) from Irbil - came under attack on Tuesday night. The fighting lasted for several hours and left casualties on both sides, the source added. A commander on the frontline near Makhmur told the BBC that at one point the IS militants got so close to his troops that they could target them with hand grenades. He said the militants had changed their tactics, and that instead of using vehicles they had walked towards the Peshmerga positions using camouflage that concealed their infra-red heat signatures. Peshmerga commander Sirwan Barzani, a nephew of Kurdistan President Massoud Barzani, told the AFP news agency that 34 militants had been killed and no territory lost in the battle. The jihadists are reportedly making regular attempts to break through the Kurdish lines in the area. Last month, they used small boats to cross the Zab river near Gwer and launch an attack inside the town that left at least 26 Peshmerga dead.